End of school year party at the 508 Amphitheater. Join us for First Presbyterian Church of Dallas' annual Blessing of the Animals ceremony. The ceremony will include a short service and individual blessings for each animal. This event is open to the public, and ALL ANIMALS are welcome accompanied by their human companions. * Free parking is available in the church's parking garage. * All animals should be on leashes or in small carriers. * The service is short and each animal will be individually blessed. Join us for The Stewpot's 31th Annual Talent Show. This year's event will be hosted in the 508 Amphitheater at Encore Park Dallas. Clients of The Stewpot will compete in six categories including vocal, instrumental, visual art, poetry, essay and dramatic reading. First, Second and Third in each category will be awarded cash prizes! In the case of inclement weather, the event will be moved into The Stewpot across the street. Come enjoy the parade at Encore Park as it travels down Young Street from Harwood toward Dallas City Hall. Activities and refreshments across the street at First Presbyterian Church of Dallas. Join us for a free benefit concert featuring Mr. CJ’s with friends at the 508 Amphitheater located next to the historic 508 Park building at Encore Park. The concert will benefit the next phase of construction for the 508 Park building (www.508park.org) which will in part help support the community ministry of First Presbyterian Church of Dallas known as The Stewpot (www.thestewpot.org). The Stewpot serves individuals and families experiencing or at risk for homelessness. We will be taking designated donations the night of the event. You can also donate on the Stewpot's web site home page by clicking the DONATE button. Free Parking available at the First Presbyterian Church of Dallas parking garage. Chairs provided. We have 200 chairs but you might want to put a couple in the car. We will also have a blanket seating area on the lawn. "Small Coolers Welcome" - Beer, Wine and Cider are fine. No hard liquor. No big coolers. In the case of rain, the event will be cancelled. Shoot Low Sheriff is an authentic Western Swing band based in Dallas, Texas. Inspired by the classic Western Swing bands, our music recaptures the sounds that swept Southern dancehalls in the thirties and forties. Shoot Low Sheriff makes the music fresh and exciting with an energy usually not associated with older musical styles. 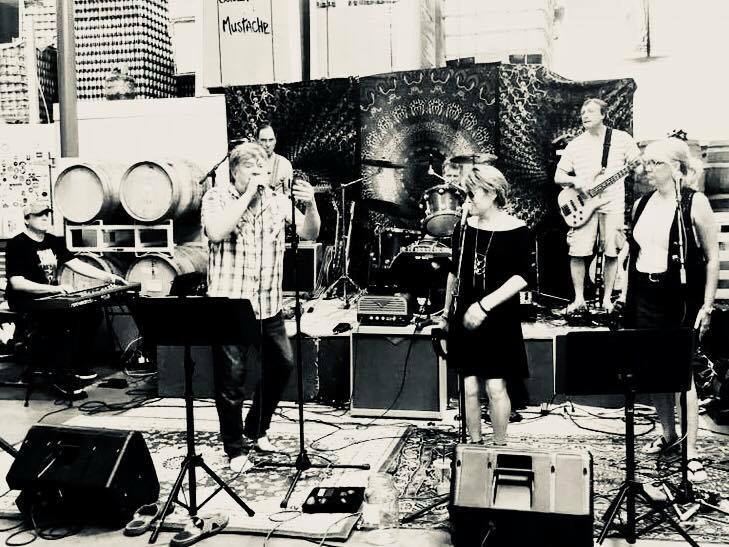 Mr CJ’s is an eclectic musical group with roots in New Orleans music, but also includes strong Clapton, Funk, Greatful Dead and Classic rock influences. Their set for 508 will primarily honor Clapton's influence on the awareness of the 508 Park building and Robert Johnson's influence on the music that followed. Josh Rockwell, CJ guitarist, is a dedicated student of all things Clapton. Information here . . . There will be food trucks in the Encore Park Community Garden at Marilla Street and Park Avenue as part of the overall event. Various activities and lunch will be in the Encore Park Community Garden at Marilla Street and Park Avenue. Join us for The Stewpot's 30th Annual Talent Show. This year's event will be hosted in the 508 Amphitheater at Encore Park Dallas. This year’s theme is LOVE. Parking available in the First Presbyterian Church garage located at 408 Park Ave.
Join us for a free benefit concert featuring Mr. CJ's Not Dead Yet with opening band the Tantric Saints at the 508 Amphitheater located next to the historic 508 Park building at Encore Park. The concert will benefit the next phase 2 of construction for the 508 Park building (www.508park.org) which will in part help support the community ministry of First Presbyterian Church of Dallas known as The Stewpot (www.thestewpot.org). The Stewpot serves individuals and families experiencing and at risk for homelessness. We will be taking designated donations the night of the event. You can also donate on the Stewpot's web site home page by clicking the DONATE button. 4:15pm 508 Park building tour - First 20 people with a donation of $20 or more get the tour and VIP seating. See where Robert Johnson, Bob Wills, Gene Autry, Lolo Cavazos and many other recorded in the 1930s. Chairs provided. We have 200 but you might want to put a couple in the car. We will also have a blanket seating area on the lawn. Event has been rescheduled for November 16, Friday, from 11am to 2pm because of the rain. In celebration of North Texas Giving Day on September 20, 2018 The Stewpot will host a party for their clients in the 508 Amphitheater at Encore Park. We will celebrate this community-wide day of giving with Stewpot clients while we raise funds for The Stewpot and Encore Park to continue serving Dallas community members. Museum of Street Culture presents "Looking for Home"
The Museum of Street Culture is not a physical building, but opens literally on the street with programming about the street. The exhibition “Looking for Home: A Yearlong Focus on Mary Ellen Mark” will be updated quarterly throughout the various venues The Museum of Street Culture calls home: the Stewpot and Encore Park’s 508 Amphitheater, 508 Park, and Encore Park Community Garden. Prior to the noon start for the event, there will be a orientation/training session for interested volunteers at 11:00 am in the Encore Park Community Garden at 514 Park Ave. Please email pat_bywaters@yahoo.com if you are interested in volunteering. The event will begin at noon. Join us for an intimate evening of songs and stories performed by Texas Slim, Jim Suhler, Aaron Burton and JMac. Gate opens 6:30pm, Show 8:30. Enjoy a 7pm complimentary tour of the famous 508 Park Bldg since completing phase one of its restoration! Free and secure parking at First Presbyterian Church (408 Park Ave.) Seating provided;chairs, blankets and small coolers welcome! "Home is Where the Heart is: A Storyslam about Homelessness" is an open mic event where we invite speakers who have experienced homelessness or are currently experiencing homelessness to freely self-express their story. The intention of the "Home Is Where the Heart is" project is to empower the possibility of connection for people through conversations about Homelessness. Come out to experience real life stories told by profound Human Beings and be a part of the conversation to transform how we relate to homelessness in Dallas. We would like to invite the generosity of listeners from all backgrounds to support the speakers. Your stake in being with us is that you are truly a Contribution to the conversation that society has about Homelessness. An Itinerary for the event day will be posted shortly. The event will be located in the Encore Park Amphitheatre. Save the date. Detail to come. Encore Park will be conducting tours of the 508 Park Building (Warner Bros Film Exchange), the Encore Park Sculpture Wall and other historic features of the Film Row district. In case of rain, event will be moved to FPC Chapel. In case of rain, event will be held. Audience is seated on stage. Open to Public. Suggested donation of $5.